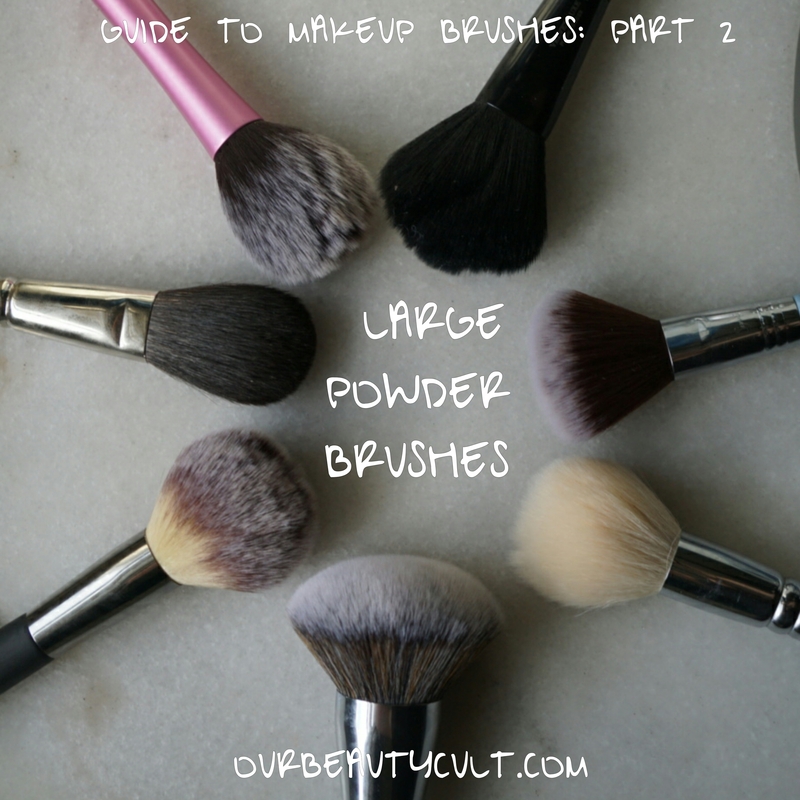 I started out this series by talking about foundation brushes and now we’re moving on to large powder brushes! Something I’m really wanting to discuss is ‘cruelty free’ natural brushes. I’m going to write a separate article because I’ve got a lot to say about the matter. But for now I just want to say that ‘cruelty free’ refers only to animal testing. So cosmetics containing animal products like carmine can still be and often are cruelty free even though animals have sometimes died to obtain those ingredients. 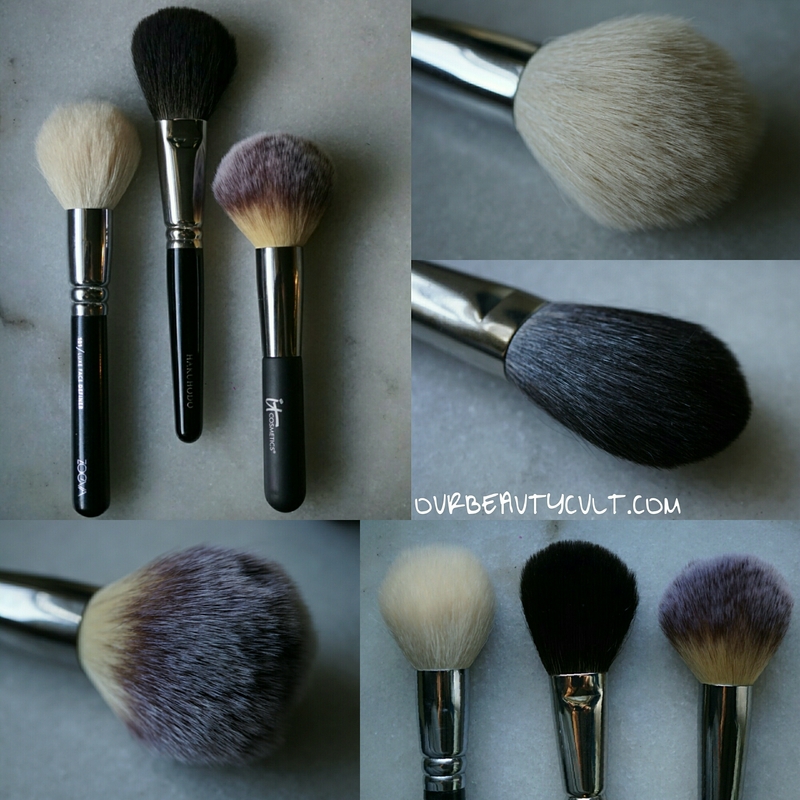 WAYNE GOSS brushes are mostly natural and supposedly the hairs are ‘humanely obtained’. I know that goats get hair cuts and it doesn’t necessarily harm them if they people shearing them are careful but I have a really hard time picturing a squirrel sitting calmly while someone brushes his hair in order to make my HAKUHODO powder brush. Okay enough. I’m saving this for a separate post. My point is that cruelty free only means that the product was not TESTED animals. That being said I still use mostly natural hair brushes but I have a hard time subscribing to the fantasy that no animals were harmed in their making. I’m going to be talking about seven different brushes: three that I love, two that I like and two that I dislike. 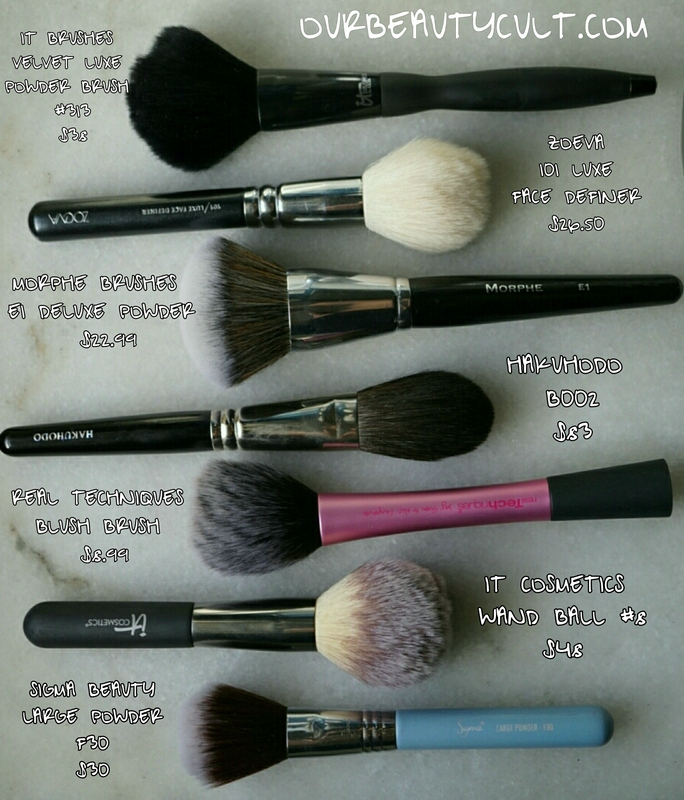 These are brushes that I use for applying translucent or setting powders all over the face. Also you may wonder why I have all of these brushes. The ones that I dislike I am going to be getting rid of once I’m finished with this series. But I keep a variety of brushes because I work as a freelance MUA. I absolutely love my blue squirrel brushes but they’re only supposed to be washed a few times a year. My work brushes get sanitized 10 or 20 during the weekend and get washed at the end of every work day. I sanitize my work brushes with cinema secrets which is an instant brush cleaner that effectively sanitizes brushes and dries in minutes. It’s a life saver but it’s harsh and I’m not going to use it on my beloved Japanese brushes. Those guys I only use on myself or if I’m doing a friend or family member’s makeup. These three are my favorite powder brushes. HAKUHODO B002 ($83)- the wifey just bought me this so it has sentimental value in addition to being an amazing brush. It has a slightly flat ‘paddle’ shape and is made from blue squirrel hair. Makeup brush preference is highly subjective. For the most part I prefer smaller powder brushes that allow me to have control over gigantic ones. This one is the perfect size for gently applying powder exactly where I want it and it’s the softest brush that you could ever imagine. These Japanese brushes can be incredibly expensive. This is a cheaper one to be honest but until I got that Oprah paper, I won’t be spending $300 on one brush. If you care for these brushes correctly, by wiping them on a microfiber towel in between uses and washing them very sparingly (they say a few times a year but I try to limit myself to once a month) these brushes will last for damn near a lifetime. We’re talking 10, 20, 30 years! Which brings me to my next point… these brushes are best for dry to normal skin. If you’re an oily girl, you’re not going to want to go weeks without washing your powder brushes. Which is not to say you can’t still enjoy these brushes but my recommendation is to get one on the lower end of the spectrum price wise. That way you can wash your brush once a week and if lasts 10 years instead of 30, so be it! ZOEVA 101 LUXE FACE DEFINER ($26.50)- this brush has a blend of synthetic and goat hairs. It’s fluffy but tapered on the end so you could use it for blush or bronzer as well. I’ve had this brush for about a year and I’ve probably washed it 100 times. It’s held up great and remains soft and hadn’t shed much, if at all. If you’re in the US, ZOEVA charges a flat rate of $16 for shipping regardless of how much you spend. So I suggest saving for awhile and placing a big order or ordering with a friend to get your money’s worth for that $16. IT COSMETICS WAND BALL #8 ($48)- IT COSMETICS makes my favorite synthetic brushes (besides ARTIS but I mostly use those for liquids or creams). This one has a rounded shape, hence the name and it’s incredibly soft and well made. It has something like 60k fibers and does a great job of picking up and distributing product. Next up are two brushes that I like but I use mostly for work. REAL TECHNIQUES BLUSH BRUSH ($8.99)- this is another synthetic brush with taklon bristles. It’s meant to be used for blush but since it’s pretty large, I use it as a powder brush. If you look at the top photo with all seven brushes, you can see that it’s nearly the exact same shape as the ZOEVA LUXE FACE DEFINER. They work a little differently since they’re made from different fibers. And I prefer the one from ZOEVA as I find that natural bristles do a better job of picking up and distributing powders but for $9 this brush has served me well for a long time. I’d highly recommend REAL TECHNIQUES (the regular line not the metals) for beginners or those who are on a budget. MORPHE E1 DELUXE POWDER BRUSH ($22.99)- I know that MORPHE recently revamped their whole elite line. This one is the old E1 and to be honest I have no idea how similar or different it is to the redesigned version. This is another synthetic brush and probably the largest powder brush that I own. I use it to apply a quick wash of translucent powder all over the face. I know that MORPHE brushes have been getting a lot of mixed reviews lately and my opinion is kinda in the middle. I don’t think most of their products are amazing but I don’t they’re awful either. I’ve had some of their brushes start to shed or get scratchy after a few months but I also have a few MORPHE brushes that I love and use all of the time. If you’re serious about your makeup game, I think it’s worth investing in good brushes over time but an $80 powder isn’t feasible for most people. MORPHE brushes and makeup might not be the best on the market but I think they’re a good value. 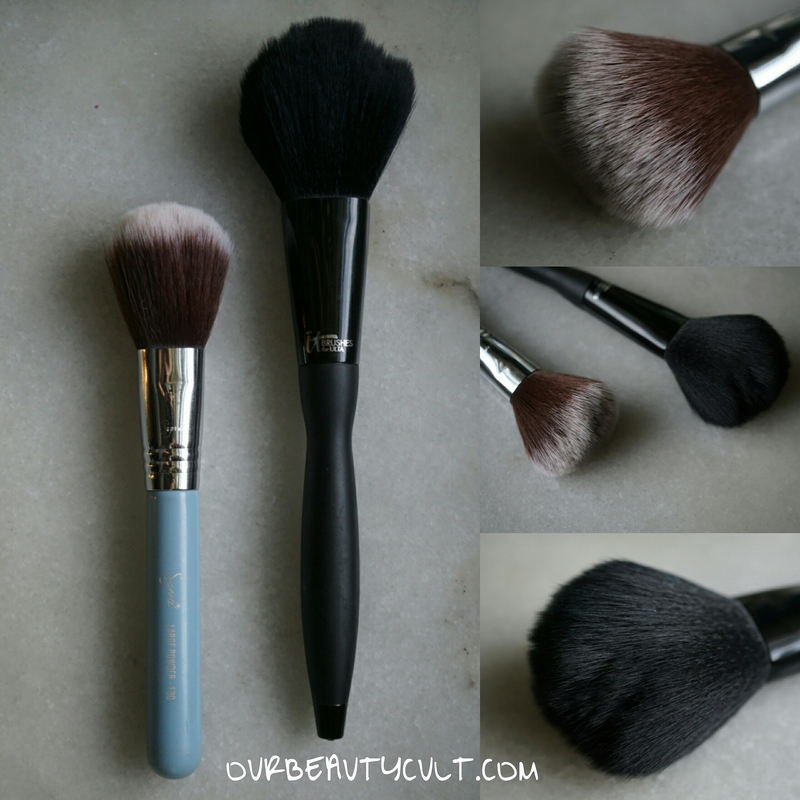 And finally let’s talk about two brushes that I don’t care for. SIGMA BEAUTY LARGE POWDER F30 ($30)- my F30 brush was part of travel sized set but I’ve linked the one that’s sold individually. I don’t care for this brush at all. The bristles feel almost like plastic. To be fair, sometimes brushes that are part of sets aren’t as high quality as the individual brushes so the full sized version might be better. SIGMA brushes are now made from their signature SIGMATECH fibers and while a lot of people swear by these brushes,for the most part they do nothing for me. I don’t feel like this one in particular does a good job of picking up product and I think there’s better brushes available for less money. One great thing about SIGMA is that they offer a two year warranty on their brushes that protect against manufacturer defects. They’re one of the only companies that offer this and they get major props for it in my book. And there are a handful of SIGMA brushes that I highly recommend that I’ll be discussing later on in this series. 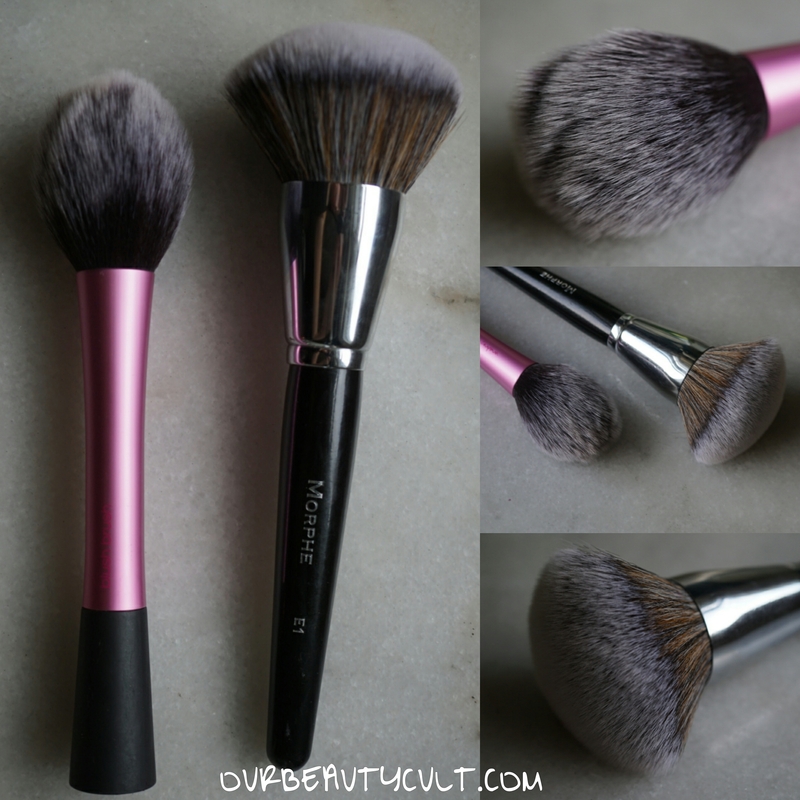 IT BRUSHES VELVET LUXE POWDER BRUSH #313 ($38)- I know that I just said that IT COSMETICS makes my favorite synthetic brushes but every brand has some winners and losers. This is the only brush that I have from their VELVET LUXE line. When I first got this brush it was incredibly soft and shaped very much like the HAKUHODO brush I talked about first but larger. But a few washings it lost its shape and it’s softness. It’s not scratchy now but it feels like there’s a film on the bristles. And the brush is almost too dense and the fibers too long. Very disappointing for a $40 brush and I don’t recommend it. Congratulations if you’re reading this! You made it to the end! I hope that this was helpful for you and that you’ll follow the rest of this series. If you missed part 1, go back to the home page and scroll down to the bottom. There’s a heading that says BRANDS WE’VE DISCUSSED and under that you can select ‘MAKEUP BRUSH GUIDE’ and all the related articles will come up. I haven’t decided what to talk about next. It’s going to be either blush and bronzer or contour and highlight brushes. Hopefully part 3 will be available next week or the following! The IT velvet lux is way to similar to the ELF complexion brush to be 10x’s the price point. I’m happy I’m not the only one that hated it.